For Remembrance Day 2017, the National Historic Sites and Monuments Board of Parks Canada honoured Canada’s Military Nurses with a special plaque. Impetus to honour all nurses who served with Canadian Forces from 1885 to the present began in 2010, when BCHNS member Hallie Sloan suggested we approach the federal government to ensure recognition of military nurses who had served in all wars. As this was to be a national recognition, BCHNS approached the Canadian Association for the History of Nursing (CAHN) to make the submission, with support from BCHNS, CNA, and other agencies. In November, after many delays, Parks Canada announced a site had been chosen for the plaque: the Remembrance area of the Saskatchewan legislative grounds, on the plinthe of the War Sisters Monument, a full-size bronze statue of a World War I Nursing Sister. 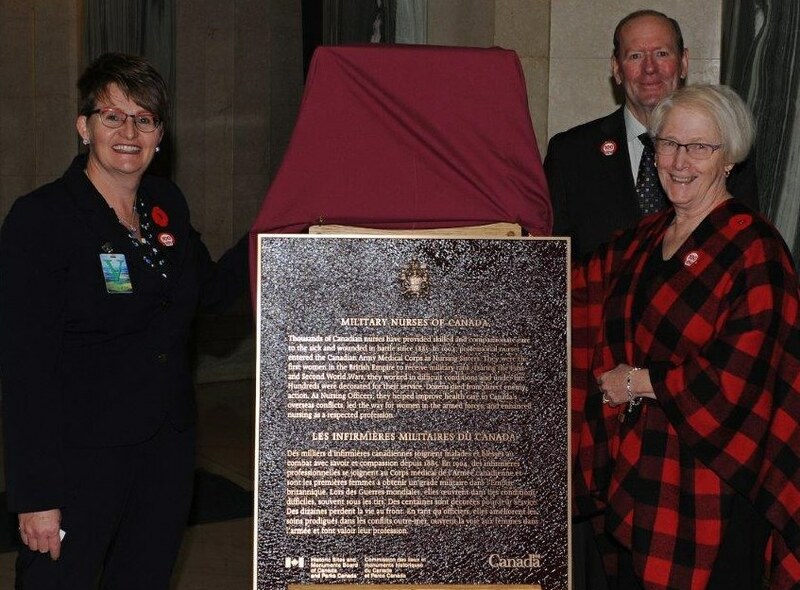 The plaque was unveiled at the Service of Remembrance held at the Rotunda of the Legislature Nov. 8. Attending the unveiling of the plaque were Marion McKay of Winnipeg, who was president of CAHN at the time of the nomination, Joanne Peterson, president of the Saskatchewan Registered Nurses Association, and Dr. James R. Miller, Saskatchewan Representative to the Historic Sites and Monuments Board and Professor Emeritus of History, University of Saskatchewan. The first military nurses in Canada were appointed and placed on Canadian Militia pay rolls in 1885 during the Northwest Campaign where they staffed two Field Hospitals in Saskatoon and Moose Jaw. Nurses since have served in the Boer War, World War I, World War II, and Korea, and in Rwanda, the Gulf War, Haiti, and Afghanistan, both in war and in peace-keeping missions. Initially, all military nurses were female and called Nursing Sisters; more recently both male and female nurses are on the payrolls and are called Nursing Officers. A plaque is being added to the War Sisters monument in recognition of the thousands of nurses who cared for the sick and wounded in battle. Thank you Glennis for this item!